So it has been a while since I posted much on this blog and even longer since I posted a new landscape shot. Thought it was about time to correct that. I headed out a few weeks ago for the first landscape shooting I have done in a year! I took a short trip up the road to Inglis Falls in Owen Sound – a favourite location of mine. Inglis Falls is a particularly challenging location to shoot as the falls themselves have an odd shape and are located in a north-facing ravine. They are also challenging to access from higher angles and can get kind of crowded. All this generally means that the light is very challenging and its really difficult to get a composition I like. 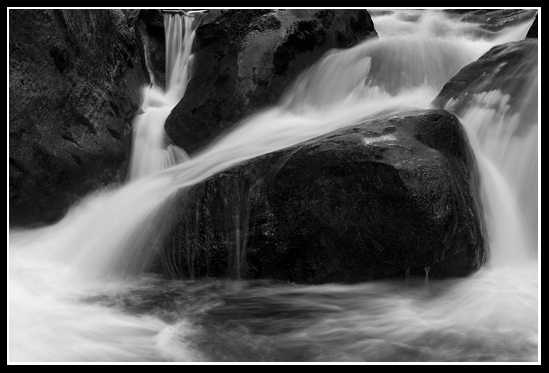 On the other hand, the bottom of the falls is stunning – full of rocks and churning waters. Lots of really interesting opportunities and frankly I just like to get in closer to the water. I like the sound of the water, the mist that’s in the air. I’ll get a great shot of the falls one day, but for now here is one I took down river. This looks a lot better as a bigger image, where you can see the details in the rock. But you get the idea.